Lodge Brothers Of Ashford were able to make the funeral of Sitha Amber Kathan (known as Amber) “the fairytale ending to her short and meaningful life” according to her mother Averil. 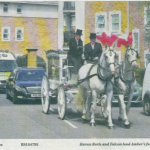 A horse and carriage led the funeral procession through Sunbury and Ashford last Friday, to the service at St Michael’s Catholic Church in Ashford followed by a cremation at Hanworth Crematorium. The horses wore bright feathers on their heads, the coffin was decorated with a colourful daisy design and the procession was also joined by representatives of St John Ambulance.